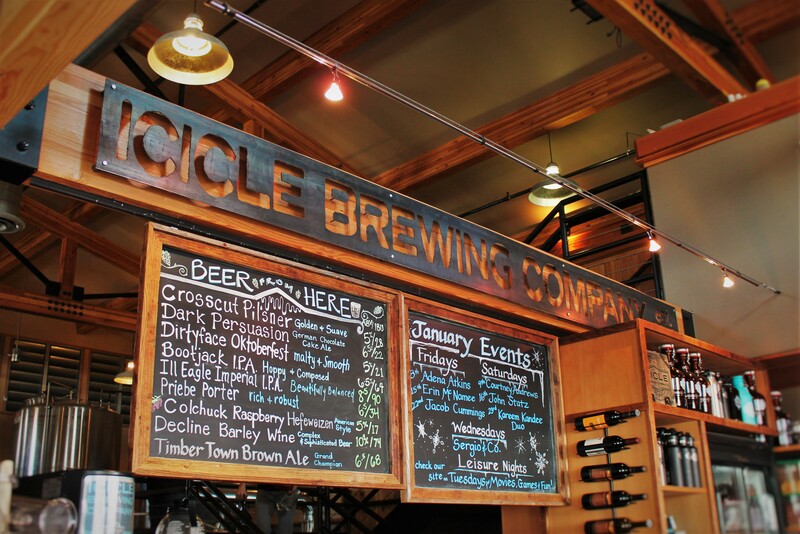 Every place you visit has different versions of itself. Seattle has the pretend romantic side that’s captured in Sleepless in Seattle, but then is also full of fog and spilled coffee. Los Angeles has the traffic and pollution you see on the news, but after dark it’s calm and quiet. And then Venice is all tourists all the time… and then not so. 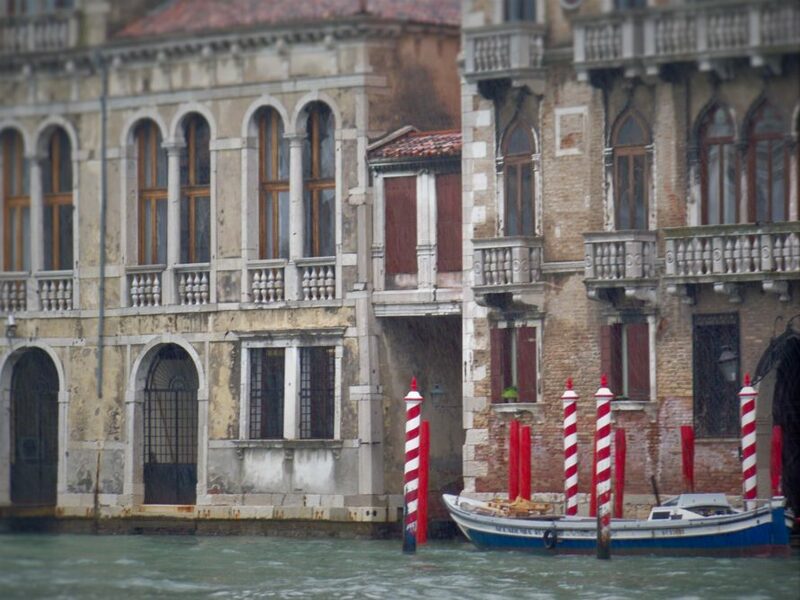 We want to share a Venice flashback or two with you, as there is so much more to the city than the thousands of tourists marching single file across tiny foot bridges. 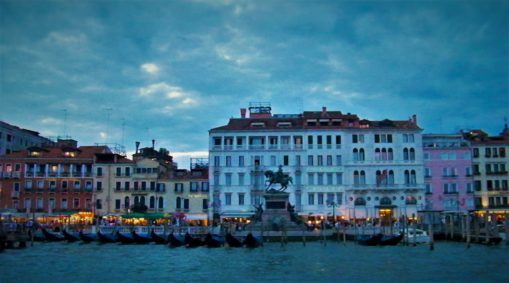 Our Venice travel stories are happy, peaceful ones. 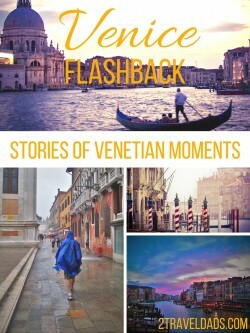 Before we begin, a disclaimer: people tend to romanticize memories after an hour or two, so even with snapping pictures and taking notes, our memories of Venice aren’t as pure as they were in the moment. Perhaps we should start walking around with a tape recorder at all times, documenting our thoughts. Or maybe a digital recorder I guess. So, two stories: one is of getting caught in a storm and experiencing an ancient city almost as you’d imagine it was 600 years ago; and the other is of being lost. Being lost is the worst, except when you’re in Venice. We arrived in Venice by train. It was a scorching day with the most amazing blue sky. It smelled like death and farts. It’s true. It was absolutely beautiful, but smelled bad. I suppose a thousand years of lagoon silt and algae isn’t going to smell like roses. The next day we saw some clouds rolling into the Venetian lagoon. Um, it didn’t look promising, but oh well. We headed to Murano to see some glass blowing and colorful houses. We got soaked in crazy monsoon that had arrived, but found shelter in toasty warm glazier shops. After a while we went back over to the main part of the city and continued to get soaked. The sun broke through, the city came back to life. The black clouds came back and dumped rain on us ten times worse than before. And then we witnessed a phenomena: shop keepers ran to their doors and locked them. If you were in you were in, but if you were outside in the rain looking for some shelter from the storm, you were locked out. 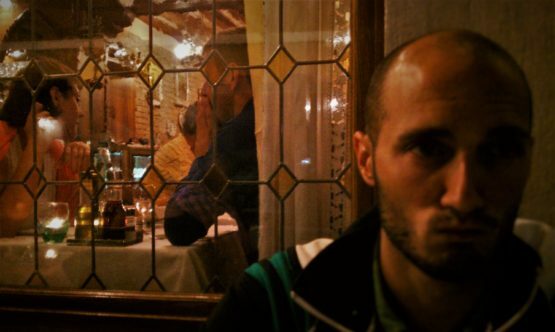 It was the most bizarre behavior we’d seen, not just in Venice, but all across Italy. Understandable to want to keep floors and wares clean and dry, but not very nice. By the evening the stench of the lagoon had completely been washed from our noses. Thank goodness, because Venice needs to smell good or smell like nothin’. 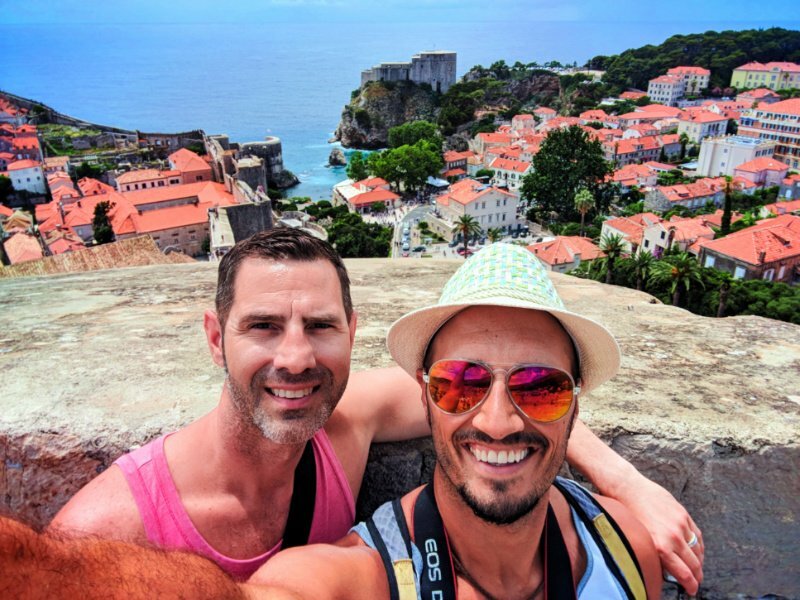 We continued on our trek, winding through the city streets wearing ponchos and looking ridiculous…but there wasn’t anybody around to question are awesomely stylish attire. We were damned fashionable in our plastic suits. 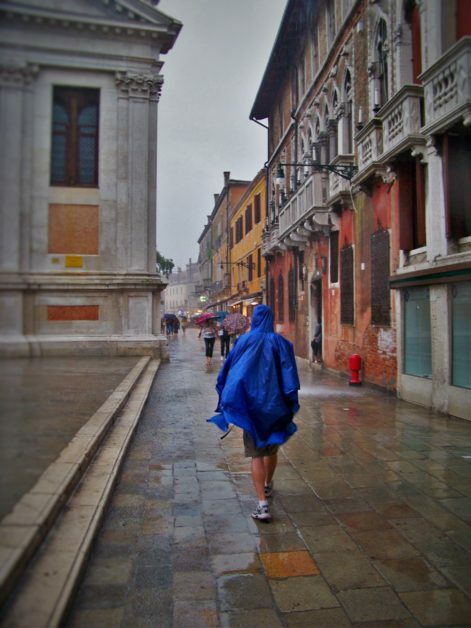 And you haven’t seen Venice in its purest form until you’ve been there in the rain. All modern aspects of the city fade; it gets quiet. The lights seem to go down a bit. The tourists disappear. It’s beyond amazing and we were blessed to experience it. Coming around a corner towards the Grand Canal, it was breathtaking and exactly what I wanted to see in Venice: gondolas, glowing light, ripples on the water, mist. It was perfect. 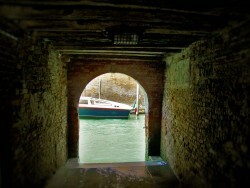 Everybody thinks of Venice as the magical canal-maze city that is warm and shimmering in the Adriatic sunlight. We got to experience the other side of Venice that is just as timeless and just as amazing as when St Mark’s Square is bathed in afternoon sun. Lesson 1: the Academia Bridge is very slippery when wet. #truestory #beware. Actually, the stone walkways everywhere are slick and even though there is drainage everywhere, there are puddles everywhere too. 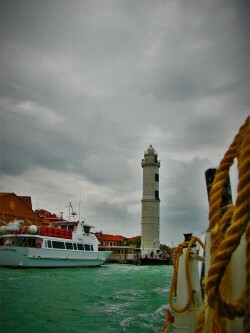 Lesson 2: all of Murano was more welcoming of wet tourists than the main, more upscale shops in Venice. Take some time out for this island, as it’s a nice change of pace in Murano and with all of the glass blowing, it’s a great place to warm up. After a few days in Venice, we were tired. Something about walking a lot and being continually confused wears you down. Don’t get me wrong, not knowing what you’ll see around each corned is amazing and you’re always surprised, but also just wanting to find your way back to a vapretto and then every turn leads to a stairway into the water…yeah, that’s frustrating. Needless to say, if you’re lost enough, you’ll find your way eventually. 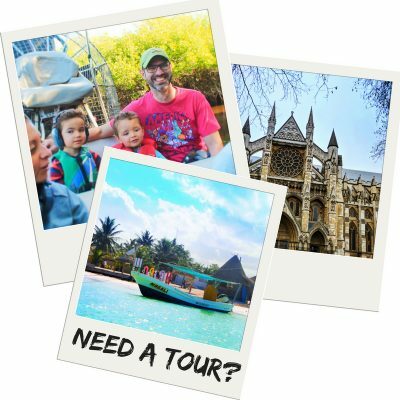 How I put it in our travel blog post What Experience Has Taught Me is “…and if you really are lost, just jump in a canal and let the tide take you out.” And that’s completely true. At the end was the perfect sunset. The sky was orange and purple. 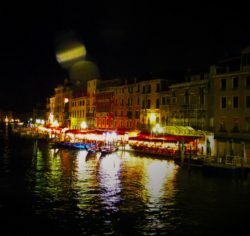 The boats had mostly calmed down and there were just a few gondolas gliding through the water. It was perfect. The only thing that could’ve added to the moment was a gondolier belting out some aria in the distance, but besides that, this was truly magical. 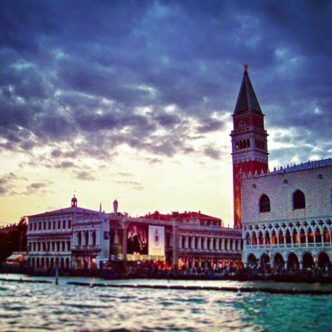 If you’ve been to Venice, you know that it’s not everything you expect everywhere. There are tons of tourists, people aren’t as blatantly welcoming as other cities, and there’s a surprising amount of dilapidation. Getting past all of that and seeing the magical light, the water and the stunning architecture all playing together, it was everything we couldn’t wanted from a perfect Venetian night and more. 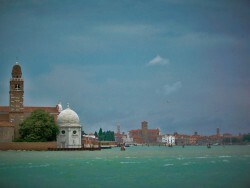 Lesson 1: Venice is most beautiful just after a storm and just before the sun goes down. If you’re visiting and have be caught in a tempesta, don’t just hide in a restaurant or museum, go experience the city. 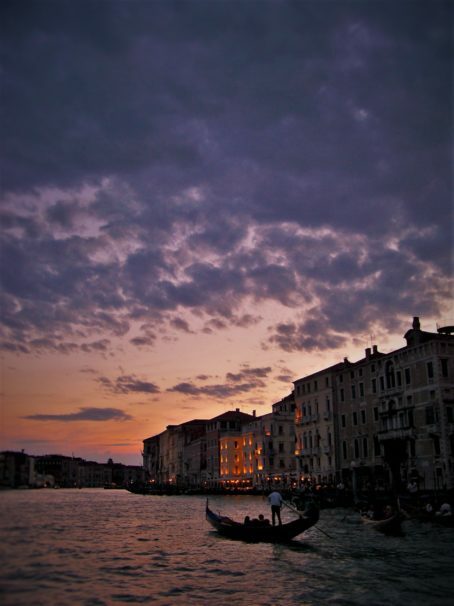 Lesson 2: for sunset, get to an area on the Grand Canal close to its mouth but not in St Mark’s Square. You won’t be disappointed with the view and you’ll be set up to start wandering the streets at night…which is a whole different view of the city. 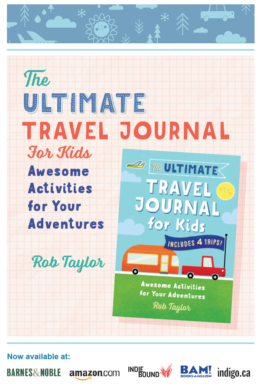 We can’t wait to go back to Venice with the kids. It’ll be so different to experience it with them and teach them about the history, the art that came out of Venice, and the perils the city faces today. For a few more stories and travel tips, check out our article about taking a New Approach to Venice: relax. 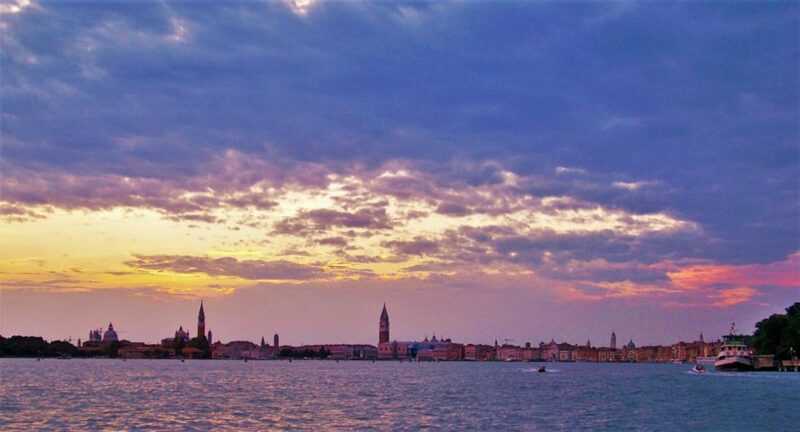 Do you have an amazing story of visiting Venice? Did you capture what you think are the most magical photos ever seen? Tell us about it or drop us a line. 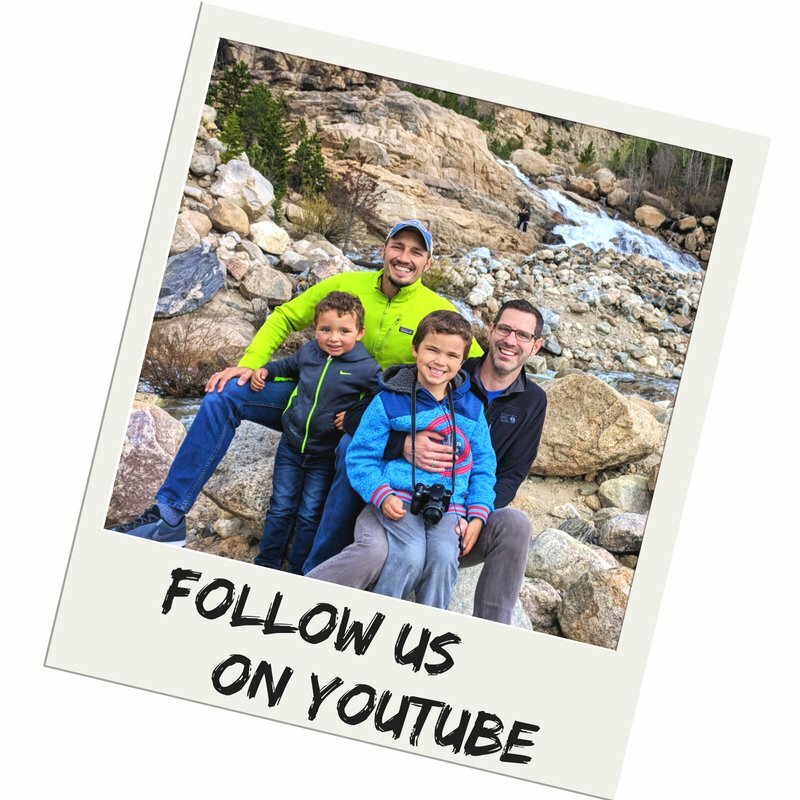 Maybe we’ll have you share your story too! I love this story. Venice is a pretty incredible place and I think anyone who goes there gets lost. 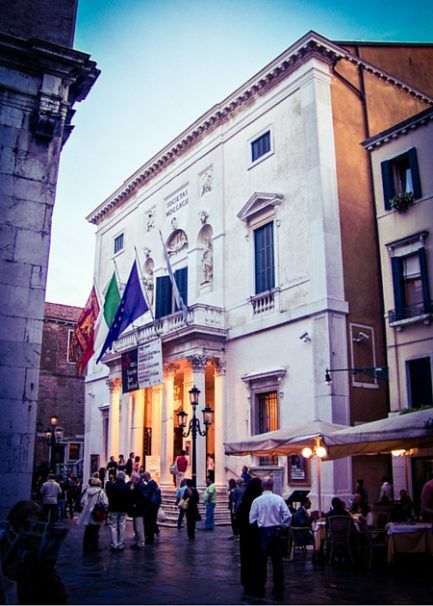 To be honest, being lost might be one of the best things to do in Venice! 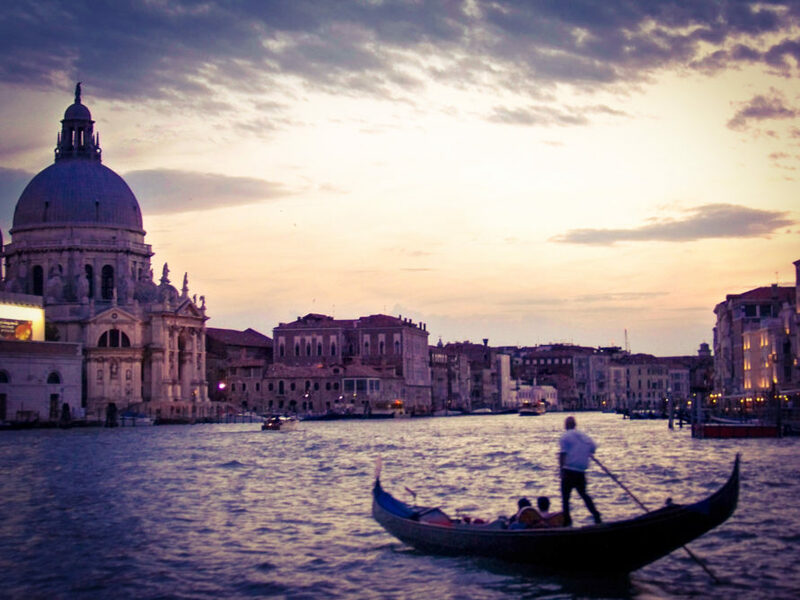 Yes, Venice is top of my bucket list! Hopefully next year! 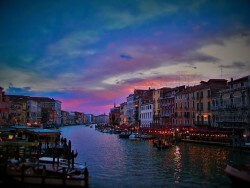 I would love to go to Venice one day! I fear it will be too “touristy” for my liking – but I look forward to seeing the sunsets you described here! I have never heard that it is smelly, I wonder if it was just a fluke. Great tips saved on Pinterest. I’d like to go one day! I love this! Its always awesome when great things come from unexpected turns! 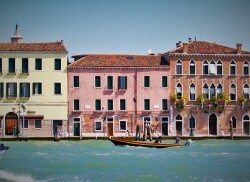 Would love to visit Venice-hopefully later this year! 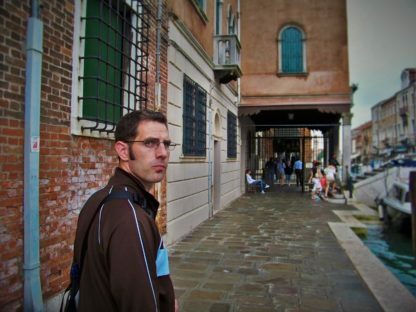 I have gotten lost in Venice as well, a couple of times. I think the first time I was over-whelmed and near tears, but the second time it was blissful. Um yea, getting lost isn’t always fun lol. But I wouldn’t mind doing so in Venice 😉 Those were good tips about where to watch the sunset. 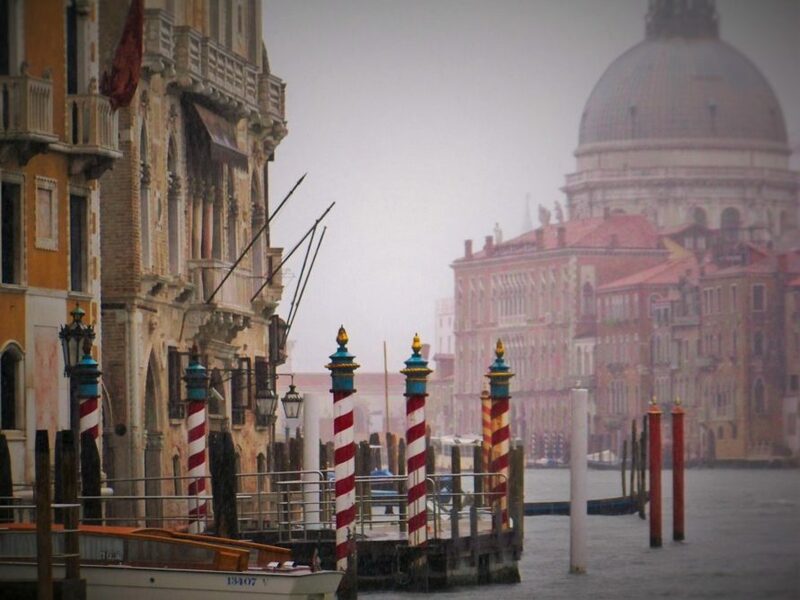 And the video…wow…you’re right, even in the rain, Venice still looks amazing. 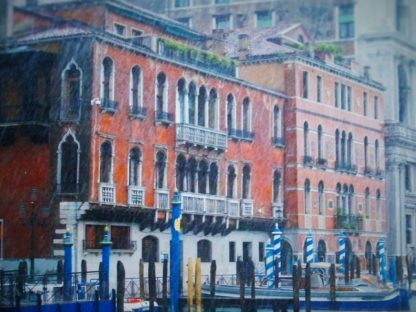 Plus, as you pointed out, once the storm is over, you’ll get to experience seeing Venice in an unexpectedly beautiful way it seems. 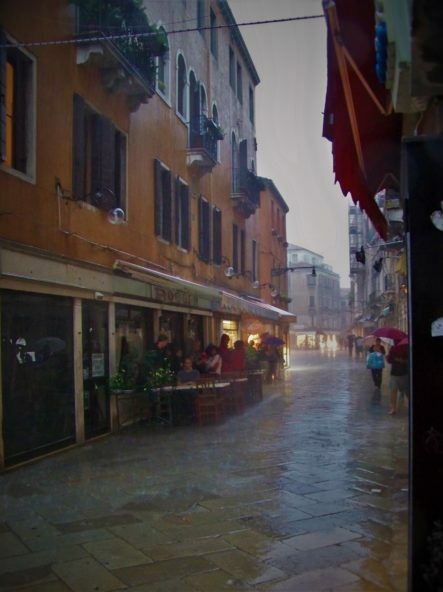 I never thought about Venice in the rain, like you said everyone always imagines it as sunny and warm, which is what it was like when I was there. And as for getting lost…I took a tour which gave me some idea of the city but definitely didn’t help much! The tour guide even admitted that he gets lost frequently even though he’s lived there for years. I would love to get lost in Venice someday 😛 Pinned it as well! Great post. 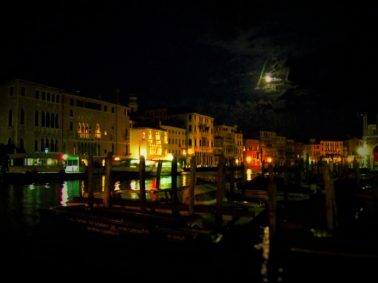 Stunning photos of Venice these. 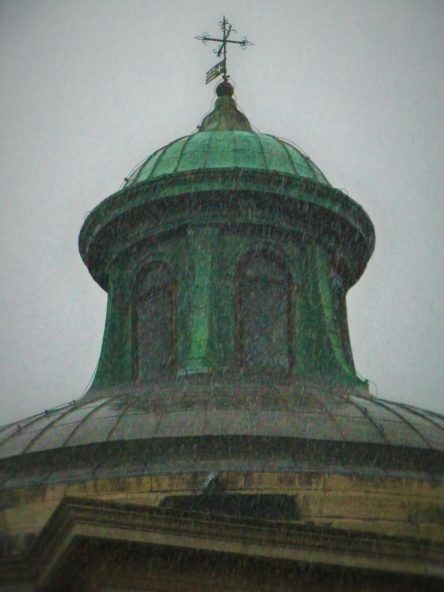 Reminds me of a trip to Paris when it was raining. A rain washed Paris was indeed a revelation. We just moved to a new city and every time we go to the market we get lost and find ourselves in very untouristy areas. And today we did it in the rain! Lol. Non-touristy India and non-touristy Italy are probably a lot different, but still. Part of the charm of photography is to shoot a destination during inclement weather. It adds a touch of romance! I see that romance here!